“The problem is people are going to hell.” ?? The Christian movement birthed yet another Protestant denomination last week. They have named themselves the Evangelical Covenant Order of Presbyterians and they are composed of a number of disaffected people and congregations of the Presbyterian Church USA who disagree with that church’s approach to a number of issues, including a recent decision to accept openly gay persons as clergy. The quote that is the title of this week’s blog is excerpted from a sermon given at the service in Florida marking the formation of this new denomination, as reported in a press article. 1. The quotation probably reflects what many if not most people think that Christianity is really about. Lots of people think that to be a Christian is all about getting to heaven and avoiding hell, which is reserved for the non-Christians and for the bad, failed Christians. It is a perspective that says those who follow Jesus (properly) will be led by him into heaven while all the other poor saps will end up in hell. Which, by the way, is the vast majority of humanity. 2. The quotation does NOT represent my understanding of Christianity, nor that held by many thousands (perhaps millions!) of followers of Jesus around the world. And, while one can certainly pick and choose passages from the Bible that seem to support the “we’re going to heaven, you’re going to hell” brand of Christianity, a perceptive reading of the Bible will demonstrate rather quickly that such passages do not embody the main point of the any of the biblical books and certainly do not embody the main points of the teaching of Jesus. An honest, intelligent inquiry into the history of Christianity will also reveal that for most of Christian history, up until just a few short centuries ago, most followers of Jesus did not think that getting to heaven and avoiding hell was the main point of their faith. 3. The “heaven and hell” paradigm was imposed on the biblical texts and the Christian faith by those who wanted to find it there. And why would anyone wish to read the texts and the heart of the faith in this way? The only conclusion I can come to is out of a desire to impose control through fear or out of a desire to experience one’s self and one’s own group as the “chosen few” who get it. The use of fear to create order is common in human history, and one that churches have not avoided using themselves. Instilling in people a fear of hell so that they aspire to better behavior can work. But, it leads to a view of God that is quite distorted. Who among us would want to cast our children into any sort of hell because they could not figure out how to behave properly? The idea of God throwing people into hell fails to comprehend the radical nature of God’s love. A desire to know one’s self to be a part of the “in” group and to know others as being “lost” is a desire that is rooted in the ego and expresses one of the worst tendencies of human nature. It could hardly be considered a Christian virtue though it is a rather tribal one. 4. Theology does not fall out of heaven fully formed. The Bible and Christian history contain many threads and strands, some of which churches have made prominent and others of which have lurked in the background. Theology arises out of the human exploration of and relationship with God, and as such it is always provisional and, to a degree, subjective. The emergence and persistence of the heaven and hell paradigm in Christianity is a good example of how theology arises. There was a time when it was not the dominant theological frame. For several years now, it has been among many Christians, including the most outwardly and materially “successful brands”. Yet, there have always been Christians who did not fully accept this paradigm, and among many it is now passing away. 5. What alternative is there to the heaven and hell paradigm? There is probably more than one. For me, the alternative paradigm is one of transformation. Our journey with God is a journey into being as fully human as possible, human in the way God dreams us to be human. That journey can only happen safely in the context of love. Rather than seeking to enforce change upon us by imposing fear from outside, God seeks to nurture change within us by embracing us with the radical divine love that is incarnate in Jesus Christ. The kingdom of heaven (called the kingdom of God in most of the New Testament) is not a place for a few well-behaved, right-believing people to hang out in after they die. And Jesus never said that it was. Rather, it is a state of being, and that state is a state of abundant life in a spiritual, not a material sense. If you want to really get a sense of what this kingdom is like, read the Beatitudes in Matthew’s Gospel. The parables of Jesus are really an expansion on those Beatitudes. And while some of the parables seem to be about heaven and hell, they are really about contrasting a false life with a true life. St. Paul is often cited when it comes to the heaven and hell paradigm, though wrongly, I think. He had certain opinions about certain behaviors that seemed to disqualify a person from God’s grace. A sensitive reading of Paul shows that his thought is more complex. But whatever we might say of St. Paul, we should not forget that he also wrote these words: “For I am convinced that neither death, nor life, nor angels, nor rulers, nor things present, nor things to come, nor powers, nor height, nor depth, nor anything else in all creation, will be able to separate us from the love of God in Christ Jesus our Lord.” (Romans 8:38-39). That comes far closer to capturing the radical depth of God’s love than any talk of going to hell ever will. I have recently begun teaching a class around Alexander Shaia’s book, The Hidden Power of the Gospels. Shaia contends that the four gospels of the New Testament are there because the early Christian church found that they functioned in an important way in terms of living the Christian spiritual journey. While he acknowledges the value of modern biblical scholarship and the light that work has shed on all the biblical writings, he invites us to set that aside to some degree and instead to focus on how each of the gospels relates to our spiritual path. In a recent session on the Gospel of Matthew, I found myself struck by Shaia’s interpretation of the baptism of Jesus. He points out that Matthew locates John’s baptismal ministry at the Jordan River, the place where the people of Israel crossed over from their years of wandering in the wilderness to arrive in the promised land. John, who is described as having come out of the wilderness to begin his ministry, effectively invites people who receive his baptism to return to the wilderness again. This point is made clear in Jesus’ own baptism, after which he is “led by the Spirit” into the wilderness. We are to follow Jesus’ example: to leave our comfortable and known lives and enter into an unknown wilderness that ultimately brings us to a new beginning, to a new life lived in God through Christ. But this journey out of the known and familiar, out of our habitual patterns, is difficult. We are promised new life when we begin the journey, but we cannot see it immediately. And just as Jesus encountered temptation in the wilderness, so we are tempted to doubt that new life really is possible for us. For Shaia, what sustains Jesus against his own wilderness temptations – and what will sustain us as well – is the truth contained in the voice that Jesus hears when he emerges from the baptismal waters: “This is my Son, the Beloved, with whom I am well pleased.” (Matthew 3:17). Jesus knows that he is beloved by God, and this knowledge gives him power as he enters the wilderness of uncertainty and temptation. It also will give us power in our own wildernesses – if we are really and truly able to believe it. Sadly, the Christian tradition has often sent a different message. The various churches have too many times given people the impression that God’s love must somehow be earned, and then told them that they are not possibly good enough to earn or deserve it. But as Matthew’s Gospel makes clear, this is not the baptismal message. In baptism, we are invited to enter the wilderness and leave the comfortable and the familiar behind. We are invited to walk away from the destructive patterns to which our egos so closely cling in order to find true life and true meaning. The only way this journey is possible is when we know the safety of the beloved. Then, we are able to have the confidence that, indeed, this journey is possible with God. In the knowledge of this love, we are truly made free to become the people God dreams us to be. I saw an article this morning about how many people in America believe that there is growing tension between classes, between the wealthy and the not so wealthy. In 2009, less than 50% of those surveyed saw class conflict as an issue. In the latest survey completed late in 2011, that percentage jumped to 66%. Among people ages 18 to 34, the percentage jumps even higher. It is not really a surprising statistic, given the economic situation with which we have been struggling for the last few years. High unemployment, coupled with debate about whether the wealthy are paying an appropriate level of taxes, have surely served to underline what has been a growing gap between the rich and the poor in this country and a shrinkage of the middle class. Naturally, as people become more focused on economic distinctions, a sense of tension or conflict can easily emerge. As many of you as were baptized into Christ have clothed yourselves with Christ. There is no longer Jew or Greek, there is no longer slave or free, there is no longer male and female; for all of you are one in Christ Jesus. Merton’s realization of his love for all people, that none of them could be alien to him, and that there really was nothing that essentially separated him from the rest of humanity, reflects this same transformational dynamic that Paul points to in Galatians. Essentially it is seeing the world with the eyes of Christ, a profound experience of loving one’s neighbor as one’s self and realizing, at a deep level, the oneness of humanity. And Merton’s experience is an expansion of St. Paul’s insight. Whereas Paul tends to focus on the way in which distinctions are overcome within the Christian community itself and the oneness that we experience “in Christ”, Merton’s experience makes clear that to see with the eyes of Christ is not simply to realize the unity of those who are in Christ but to also see the unity that transcends even the distinction of the baptized. As we live in the midst of our own social tensions, I wonder what it would be like for us to take seriously the teaching of St. Paul and the experience of Thomas Merton. We have become a society that focuses on difference and division. And, there are some very good reasons why that has happened. In some respects, that focus is a by-product of pointing to genuine injustice. As we seek to face that injustice and to transform it, however, I believe we are called to do so from the perspective that we have as a result of our being “in Christ”. That is, we are called to remember and to see our essential unity. This coming weekend, we will remember the life and witness of Dr. Martin Luther King, Jr. He was a great champion of the underprivileged, a courageous challenger of the world’s injustices. It seems clear to me that one of the things that motivated him was precisely this Christ-like seeing of the essential oneness of humanity. It was this, I think, that was so much a part of his famous “I Have a Dream” speech. May we have this same courage and grace to fight injustice as we hold this vision of the oneness of the human family. On Friday, January 6, we celebrate the Feast of the Epiphany. Although, most Christians will not celebrate it in any particular way, falling as it does most of the time on a day other than Sunday. I have often wished that we could celebrate the Epiphany the way we celebrate All Saints Day in November. All Saints is always on November 1, and yet in The Episcopal Church, at least, we can celebrate it on the first Sunday after November 1 so most people don’t miss out on it in years when November 1 doesn’t fall on a Sunday. But no such luck with Epiphany. The first Sunday after January 6 is designated for celebrating the Baptism of Jesus, and so the Epiphany story does get missed by most people most of the time. Yet, it is well known. 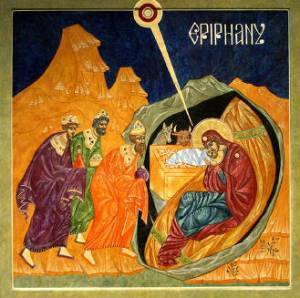 Epiphany is the day when we remember and celebrate the story of the three wise kings who, as told in Matthew’s Gospel, travel from the East to pay a visit to the baby Jesus, bearing gifts of gold, frankincense, and myrrh. Modern sensibilities tend to get caught up in the “facts” of the story. “Did it really happen?” The more important question is, “Why does Matthew’s Gospel tell this story?” What is it trying to tell us? The story of the three kings is employing a rich set of symbols to say something about who Jesus is (as experienced by the early Christian community). The appearance of the star that guides the kings to Jesus’ birthplace connects Jesus to the cosmos and, in an age that saw the world as flat and heaven (and thus God) as “up there”, it links Jesus to the heavens, to God, indicating that something of great significance has happened and that God is somehow involved. The fact that the wise kings are described as coming from outside the Jewish community is meant to communicate that this significant event is important not just for the Jewish people, but for all people. Indeed, given the history of the Jesus movement, one might argue that the three non-Jewish wise guys signify that the Jesus event is not for the Jewish people but for those outside the Jewish community – God truly doing a new thing. And the gifts which the kings bring have significance, as well. Gold, of course, is something of great value and has often been associated with kingship. Thus, the gold emphasizes Jesus’ earthly value and significance. Frankincense was often used as an offering to the divine, and so it emphasizes Jesus’ divine significance. Finally, myrrh was used extensively in the ancient world in burial rites, and thus it points us toward Jesus’ eventual death (and resurrection). Myrrh was also used in healing rituals, and so the gift perhaps indicates a connection between the death and resurrection of Christ and the healing of humanity. All of the symbolic elements of the story converge in the name given to the day when we remember and celebrate the story: Epiphany. The word itself refers to a revelation of divinity. But it also refers to an insight, often a sudden insight, into the essence or nature of something. By telling the story of the three kings, Matthew seeks to impress upon us the significance of Jesus for God and for us. Those who are wise, the story tells us, will realize this significance and be drawn to Jesus. As we move beyond the Feast of the Epiphany this Friday and into the season of Epiphany, which will take us up to Lent, Matthew’s story also poses for us a couple of questions to contemplate: What is the significance of Christ in my life? And, in the spirit of Epiphany, How does my life demonstrate that significance? For, as the teaching of Jesus makes abundantly clear, it is not enough to claim that Jesus is significant. We are called to manifest that significance in the living of our lives so that it shines like a star, giving light to a world too often darkened by wisdom that is no wisdom.